JERUSALEM—As terrified teenagers 65 years ago, Menachem Sholowicz and Anshel Sieradzki stood in line together in Auschwitz, having serial numbers tattooed on their arms. Sholowicz was B-14594; Sieradzki was B-14595. The two Polish Jews had never met, they never spoke and they were quickly separated. Each survived the Nazi death camp, moved to Israel, married, and became grandfathers. They didn’t meet again until a few weeks ago, having stumbled upon each other through the Internet. Late in life, the two men speak daily, suddenly partners who share their darkest traumas. The twist of fate doesn’t end there. Two brothers who were with them in the tattooist’s line have made contact since hearing of their story. 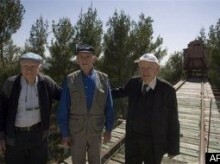 One of the brothers joined them for a reunion on Sunday at Israel’s Holocaust memorial Yad Vashem. With tears in their eyes, the three embraced warmly and caught up on painful memories in Hebrew and in Yiddish. “This is my victory,” Sieradzki said. The meeting came a day before Israel marks its annual Holocaust remembrance day beginning Monday night, commemorating the 6 million Jews murdered in World War II. The four survivors, with the consecutive serial numbers, are among hundreds of thousands of survivors who poured into Israel at the birth of the Jewish state. An estimated 250,000 are still alive in Israel, carrying the physical and emotional scars of that era. The unlikely reconnection began when Sholowicz’s daughter found a Web site that detailed Sieradzki’s odyssey from Auschwitz to Israel. It struck her as eerily similar to her father’s. All the same elements were there—being separated from parents and siblings and never seeing them again, searching for scraps of bread to eat in the Polish ghettos, surviving the selection process of Dr. Josef Mengele, the infamous Auschwitz camp doctor who decided who would live and who would die. They endured Nazi death marches to two other camps in which any emaciated prisoner who fell behind was shot in the head. Later, both moved to Israel, fought in its 1948 war of independence, and made careers in its military industry. Still, the two men never met and the name Sieradzki on the Web site didn’t ring a bell. Then Sholowicz, 80, saw the man’s number and he froze. He called Sieradzki the next day. They recently met halfway between their homes in Haifa and Jerusalem, and a photo of them and their tattoos appeared in an Israeli newspaper. Sieradzki says it is astounding that both survived the Holocaust and lived this long. He can never forget arriving at Auschwitz and seeing Mengele, who with a flick of a thumb decided fates. Those too old, too young, or too ill were sent to the gas chambers and the crematoria. Those fit enough to work were stripped, shaved and tattooed and then forced into labor. In an even more unlikely development, Sieradzki recently discovered who stood behind him in line for tattoos—Shaul Zawadzki and his older brother Yaakov, serial numbers B-14596 and B-14597. They too survived Auschwitz and made it to Israel. “It’s unfathomable that something like this could happen. I’m still in shock,” a shaking Yaakov Zawadzki, 82, said at Sunday’s reunion. He said his brother could not make the meeting both because he had to care for his ailing wife and because he could not bear the emotional burden of bringing up the old memories. Like many survivors, Sieradzki, who in Israel took on the Hebrew name Asher Aud, also kept silent for more than half a century. Only when he returned to Poland in the early 1990s did he open up. He founded an organization of the former residents of his hometown of Zdunska Wola and resurrected the Jewish cemetery there. The organization’s Web site is what first drew the attention of Sholowicz’s daughter. Now that story includes a new chapter he shares with three others, bound together forever by the numbers inked deep into their arms.